After around a year, the wheels came off the bus (or super cycle) of the Fourth World. Sales dipped, and books were canceled. The remarkable achievements that were “The Pact” (New Gods #7) and “Himon” (Mister Miracle #9) and “The Death Wish of Terrible Turpin” (New Gods #8) were not seen as masterpieces at the time. 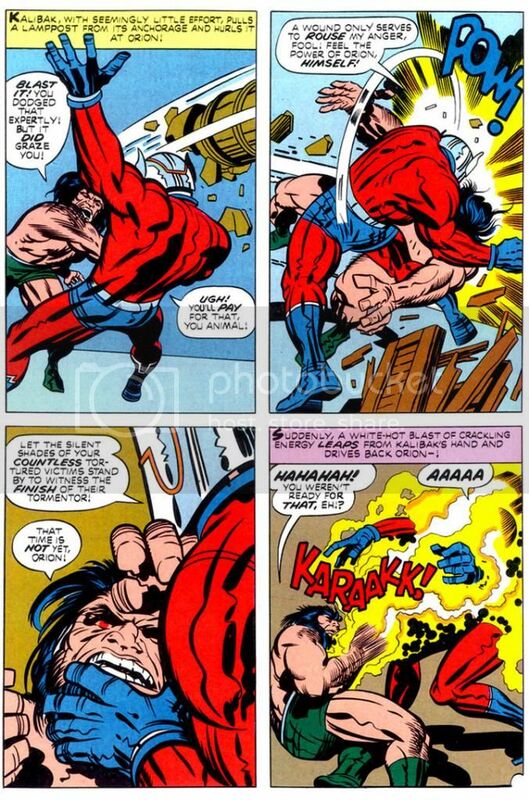 The combat between Orion and Kalibak in the Turpin story will remind you what sort of glory can be found in a slugfest. But then it ended. The last issue of the New Gods (“Darkseid and Sons,” #11) was, in fact, brilliant (the run from #7 through the end is worth everyone’s time). The story didn’t end as Kirby wanted it to, but it was a very effective stopping point with a lot of “What?? What just happened?? ?” moments. It was very satisfying. The end of the Forever People was much more of a mess, possibly because their action was always peripheral to the New Genesis/Apokolips story being told in NG and Miracle. “The Kids” end up stranded on a paradise planet in a faraway dimension when the Pursuer’s lance blows up, “destroying” the Infinity Man. While it technically makes sense, the pretext is as weak as it sounds. Mister Miracle lasts a bit longer than the other two, but when the Big Story falls away, it becomes a series of one-off monster stories. This didn’t have to be a problem. Kirby spent the ‘50s being the master of one-off monster stories. According to Evanier’s essay, though, Kirby was feeling demoralized and his heart wasn’t quite in it. You only have to notice that one of the stories begins with Miracle and Barda stumbling on a “haunted” house while walking in the woods near their house. Yeah, time for a new direction (which took him to the Demon, Kamandi, et many al., so one can’t entirely complain). 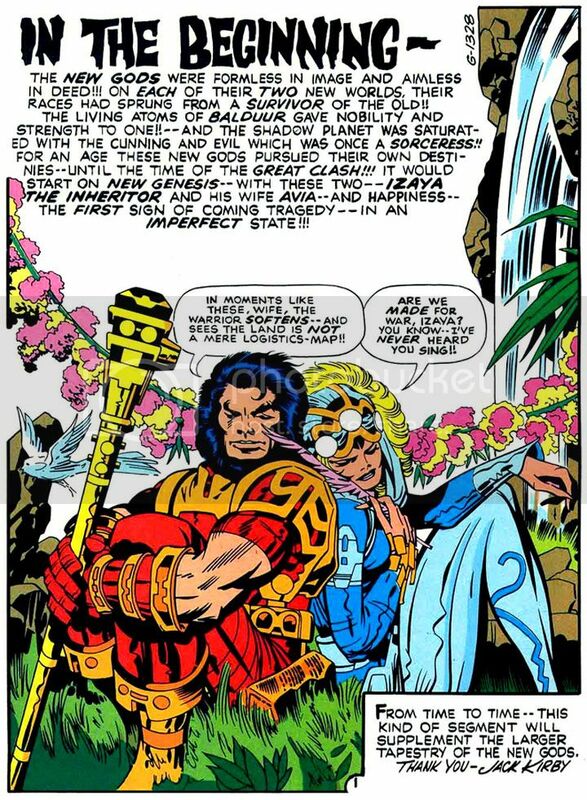 Kirby’s vision from the beginning of the Fourth World was an enclosed story that reached through a number of books and ended in a Fourth World Ragnarok, closing the book on these characters for good. I don’t know how he ever thought that was going to happen. 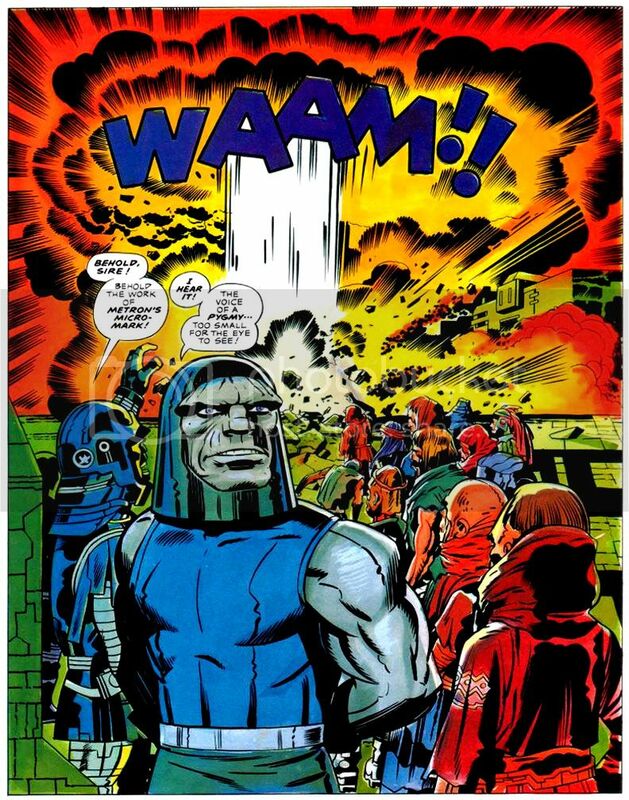 It seems almost quaint, looking back from the other side of the graphic novel naissance, but in 1972, DC Comics was not going to let Kirby develop amazing properties – which is what he was brought in for – and then have them succumb to irrevocable destruction. 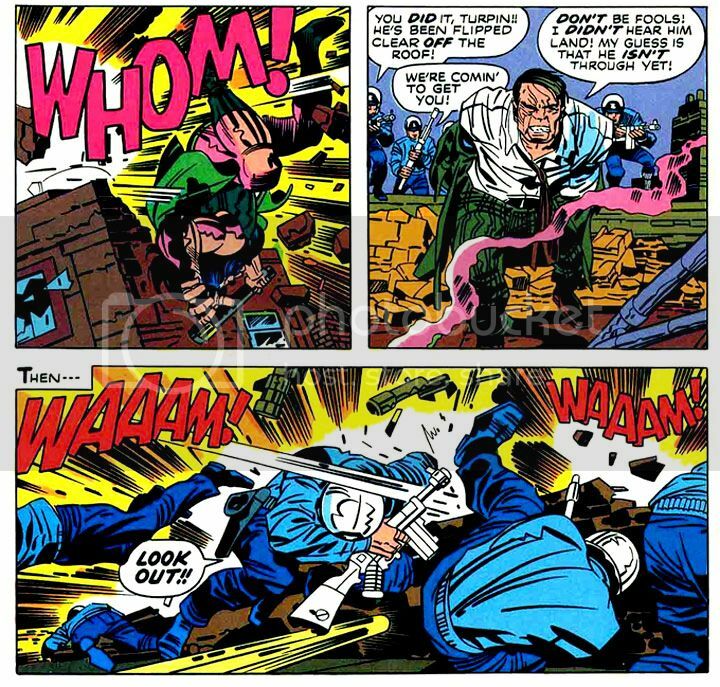 This may have been the one place where Kirby – a man preternaturally in synch with comic book aesthetic – may have had an ambition for something that can never exist in the superhero-comic book medium: an ending. This wasn’t a function of the times Kirby was writing in, but a function of the medium. Just consider the New Gods. We’ve had The Hunger Dogs, Kirby’s own imperfect – but beautiful! – attempt at an ending. We’ve had Death of the New Gods. We’ve had Final Crisis, where Darkseid is “finally” killed. Wait, who was that who was featured in the new Justice League 23.1? To butcher Fitzgerald, “There are no last acts in comic book superhero lives.” Even characters who are never brought back, are constantly being brought up (e.g., Jor-El, Gwen Stacy). I wouldn’t be the first to suggest that while Crisis of This, That, and the Other Thing had all the hallmarks of a Ragnarok, they lacked the one key element: the end of the world. They weren’t resetting the DC universe, they were resetting the DC stylebook. I think Kirby really wanted the end of the world for his characters. He had the Wagnerian urge. But like so many great creators he was an inventor, not a destroyer. He began things. He began great things. And not a single one of them – not Cap, not the FF, not the New Gods – has ended. And even if they fall into a space where they seem to have ended – books get cancelled – there is always a new issue coming down the line. But this is not the problem with endings. The problem with endings is that our experience of the work is shaped by “how things turn out.” Forget how things turned out. These are astonishingly rich stories, executed to a ridiculously high degree; the creation of a visual aesthetic that’s analogous to Tolkien’s linguistic aesthetic. This will always be true, no matter how things turn out. Kirby could not achieve his operatic ambition, but that’s irrelevant. I love these books. Gary Chapin usually blogs about French accordion music over at www.accordeonaire.blogspot.com.